As dedicated in-hospital emergency providers, few of us truly understand or get to experience the difficulties and unique challenges facing our pre-hospital colleagues. Beyond the EMS handover and transfer of patient care, we seldom interact with this large and extremely important facet of our medical system. It is easy to forget that the pre-hospital environment is even more chaotic, uncontrolled, and resource/personnel-limited than most of the Emergency Departments (ED). It is easy to forget that the 2-person team patching in to you is often times stretched to its limits providing high quality care with one partner driving and the other playing the role of an entire resuscitation team. It is easy to forget and hard to remember who and what is on the other end of the patch phone unless you’ve experienced all this first hand. 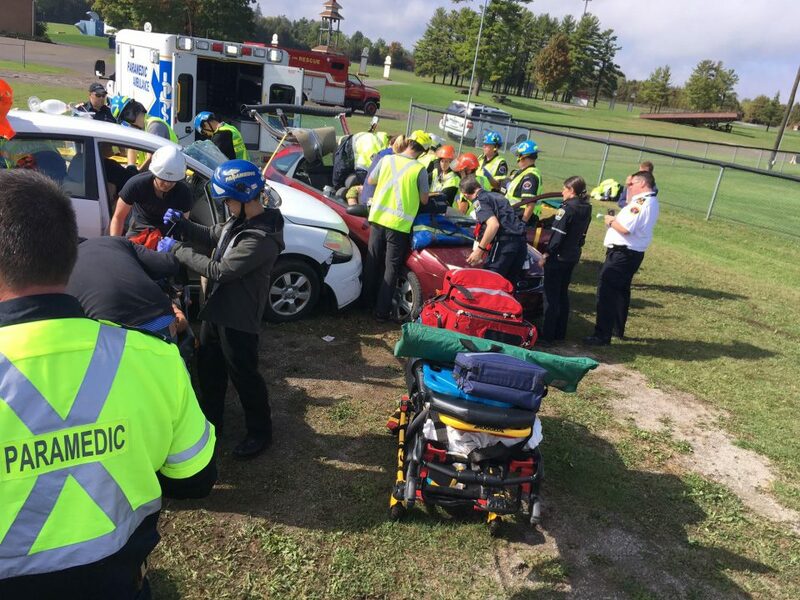 This was the impetuous for creating “EMS Bootcamp.” The University of Ottawa and Queen’s University emergency medicine programs, in partnership with 9 surrounding Eastern Ontario paramedic services, the OPP, and fire department participate in a yearly exercise together. Rotating residents through 8-9 pre-hospital scenarios to familiarize residents with the hardships and unique challenges of the pre-hospital environment. From being thrown around in the back of an ambulance to mass casualty scenarios and patient extrication – short phrases often glossed over in the EMS handover transform into eye-opening experiences and insights into the everyday lives of our pre-hospital colleagues. 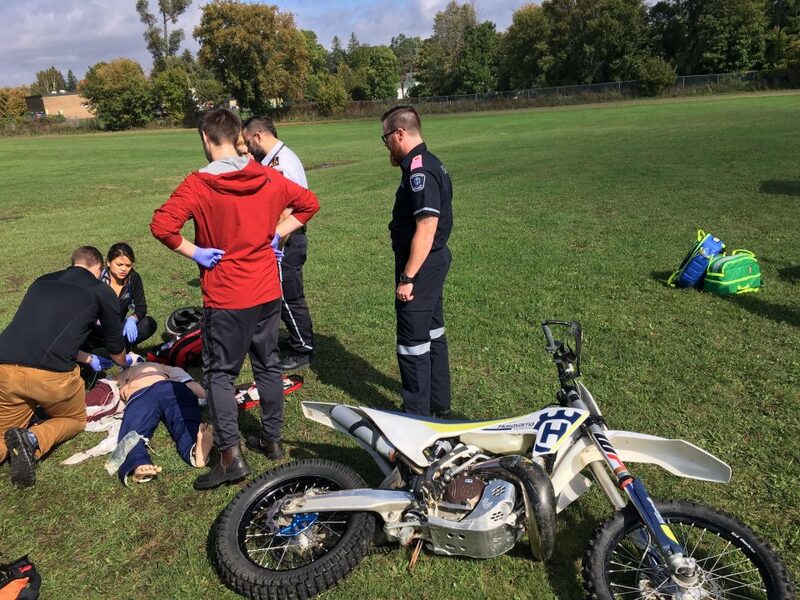 As far as the authors and organizers are aware, this is a unique experience in its scale and goals to provide high-fidelity / in-situ pre-hospital simulations to Canadian emergency medicine residents. 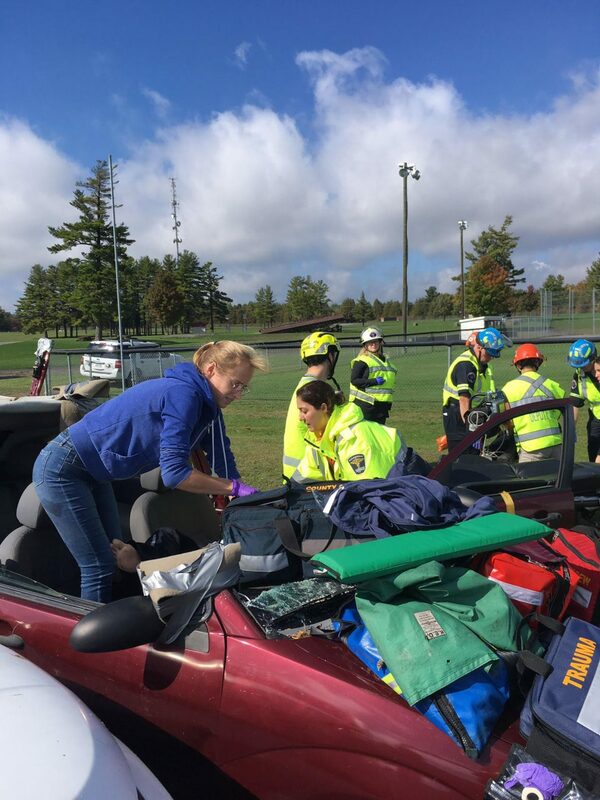 A full-day experience where EM residents rotate through 8-9 prehospital scenarios working alongside paramedics, police, and the fire department to provide medical care, extrication, and patient transport. Residents are taken out in ambulances to various calls as the first responders. 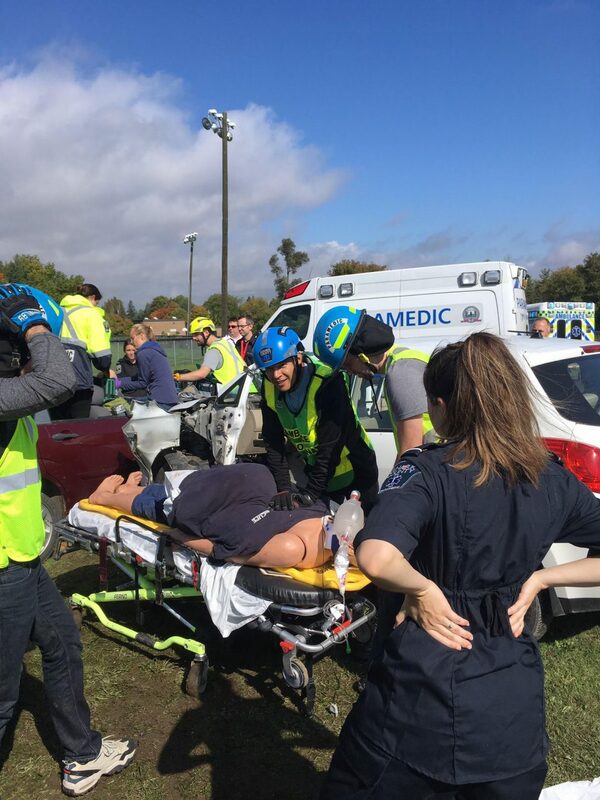 These scenarios are staged at the local fair ground and acted out by a huge team of volunteer paramedic students. These simulated scenarios mimic those that local Fire, Police, and EMS respond to. They include scenarios such as mass casualty, MVC and prolonged extrication, unstable patients during transport, excited delirium, and Patch phone calls to base hospital. The goal of EMS Bootcamp is to familiarize emergency medicine physicians and residents with some of the challenges that paramedics, fire, and police manage while on duty. By understanding the pre-hospital environment we can enhance the skills of emergency medicine physicians and residents who will be guiding paramedics over the Patch phone. What problem does this innovation solve? EM residents have limited experience in prehospital medicine despite interacting daily with prehospital EMS providers. EM residents are expected to answer Patch phones and provide online medical support to EMS providers without a clear framework for their environmental limitations, conditions, equipment, and training. EMS Bootcamp seeks to remedy this through first-hand in-situ experience for EM residents organized and run by paramedics. Not only does EMS Bootcamp allow EM residents to experience the pre-hospital environment through the lens of scenarios run by pre-hospital providers themselves, but it allows paramedics an opportunity to become leaders in continuing medical education. The Bootcamp utilizes both high- and medium-fidelity simulation mannequins as well as live actors (paramedic students from local colleges) to create an authentic experience. Debriefing sessions are held following each scenario to emphasize take-home points. This day aims to strengthen relationships between paramedic services, EM staff (physicians and residents), and between residency programs. The Bootcamp utilizes the Edwardsburgh Cardinal Fire Station which serves as the “Dispatch” centre. A total of 9 paramedic services, police and fire departments volunteer their time and resources to make this experience possible. These are located predominantly in Eastern Ontario. The participating EMS departments supply their own ambulance and crew for the day. Of course no initiative of this size could function without central command. EMS Bootcamp was the brainchild of Drs. Andy Reed (Queens) and Richard Dionne (Ottawa). This year’s production was organized by Drs. Daniel Beamish and Harrison Carmichael, both EMS fellows at the University of Ottawa. 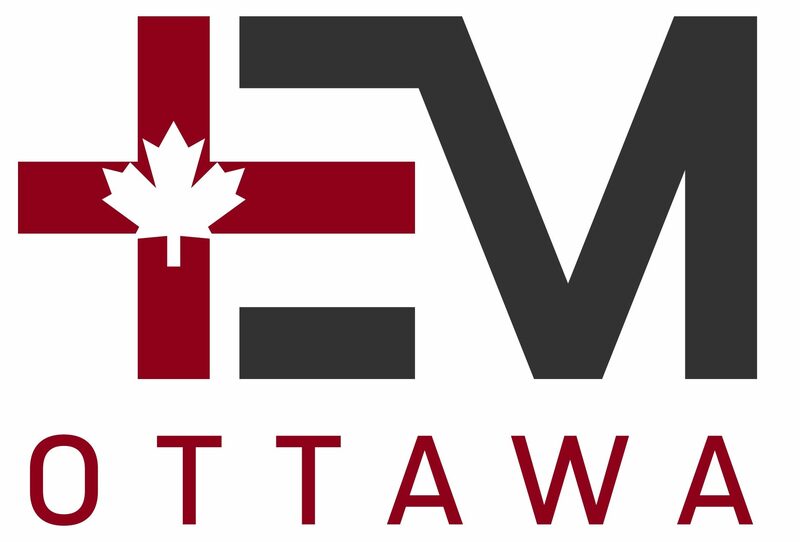 Other innovation team members who played a major role in the evolution and success of this and previous iterations include Dr. Michael Austin (Ottawa), Dr. Andrew Willmore (Ottawa), and Dr. Simeon Mitchell (Ottawa). What lessons have we learned by creating and implementing EMS Bootcamp? To sum it all up: EMS providers work in extremely challenging conditions. Nuanced decisions around extrication, medical care, transport, and even weather play critically into an EMS provider’s ability to provide excellent pre-hospital care. Residents learn and re-learn this key point through various scenarios, for example, discovering how difficult it is to manage a patient in the back of an ambulance and understanding the quality of CPR that can be provided. Beyond the physical challenges, limitations on therapies available to different levels of EMS providers also becomes an important decision point for paramedics teams and Patch phone physicians. Residents become familiar with EMS equipment and protocols to better understand interventions that can be provided in the pre-hospital setting. Through our yearly EMS Bootcamp exercise, we have learned that paramedics have much to teach emergency medicine residents about pre-hospital medicine. Through the Bootcamp they are able to pass on their wealth of knowledge and years of practical experience in the pre-hospital environment, allowing EM residents to become better Patch MDs. Through this initiative paramedics feel empowered to share their experience and knowledge in a safe and encouraging environment. We hope this collaboration will lead to greater mutual understanding and a more harmonious working environment for physicians and paramedics. All participating residents unanimously came away from the day with first-hand experience, better insight, and a greater appreciation and respect for our pre-hospital colleagues. We hope that these young physicians will take the lessons they learned and apply it being a better Patch physician at their base hospital and role model a respectful environment when collaborating care with our pre-hospital colleagues.